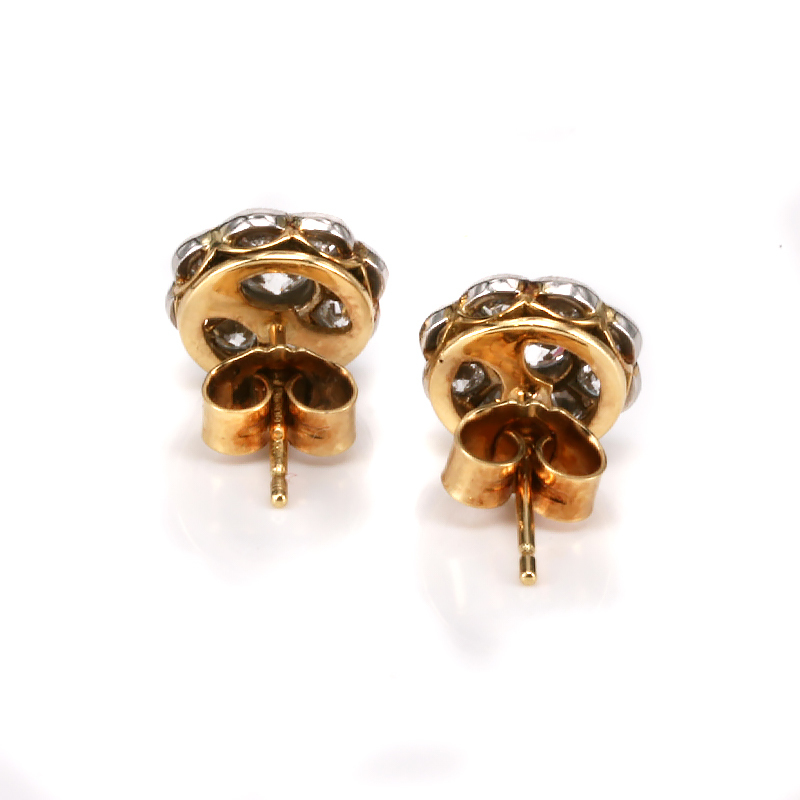 Product code: ES6839 Categories: Sold Items, Sold earrings. Here are such an elegant pair of Art Deco diamond cluster earrings that date from the 1920’s and stand out so beautifully on the ear. Hand made in 18ct yellow gold and platinum, each earring is set with one diamond surrounded by eight smaller diamonds and the setting at the top in platinum has the elegant milgrain finish. The milgrain finish can be seen as that elegant crimping around the edge of the setting which is typical for many Art Deco pieces of jewellery such as these. Each earring measures 10.2mm in diameter making them the perfect size to wear all the time and get the attention that they rightly deserve and are fitted on post and butterfly fittings. The diamonds are all European cut diamonds with the centre of each measuring 0.28 carats and the surrounding eight diamonds having a total weight of 0.48 carats bringing the total diamond weight of these earrings to 1.52 carats. They are F to G in colour and Vs to Si in clarity and the sparkle from each earring is so beautiful and elegant and typical of the stylish and fine quality of the 1920’s. These Art Deco diamond cluster earrings are just perfect and will always be loved and admired. Tag: Art Deco diamond earrings.